2018 Yamaha YZF-R3 ABS CONQUER ROAD Yamaha has raised the bar again in the entry sports class with the addition of ABS braking to very popular R3. Sporting a twin cylinder 320 cc engine and an ultra lightweight chassis, the R3 offers a solid combination of class-leading power and light, agile handling. Add in an easy to ride personality and confidence inspiring ABS brakes and you have the perfect recipe for a super fun riding experience! PERFORMANCE Powering the R3 is a 320 cc, DOHC, parallel twin featuring a 4-valve cylinder head, 32 mm throttle body fuel injection and 6-speed transmission. Dig a bit deeper and you will find many of the high tech features found in our R6 power plant inside this engine too. Highway speeds are easily obtainable making the R3 a very versatile machine. EASY RIDING The R3 has been designed to provide a fun, enjoyable riding experience. To R3 utilizes a lightweight diamond type steel frame which is narrow and compact with a low 780 mm (30.7") seat height. The addition of ABS gives you piece of mind while braking under pressure or in wet conditions. Features may include: ENGINE Lightweight & compact, 320cc, liquid-cooled, DOHC, 8-valves (4-valves/cyl), fuel injected, inline-twin cylinder engine. The engine has been designed to provide solid performance right across the rev range, with very linear throttle response, low vibration & excellent fuel economy. 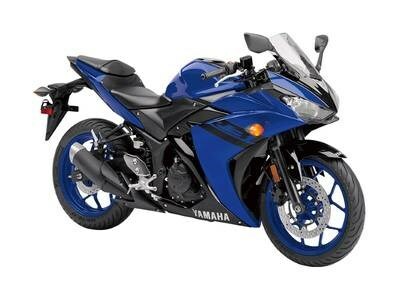 Downdraft style, compact combustion chamber The YZF-R3 uses regular 87 octane gas Intake valves are 26 mm in diameter & exhaust valves are 22.5 mm. Valve adjustment interval is every 42,000 kms. Automatic cam chain tensioner. Lightweight, all aluminum DiASil cylinder (die cast all aluminum cylinder with silicone content). Offset cylinder design. 180 degree crankshaft with uneven firing order. Gear driven "primary coupled-force" balancer shaft. CHASSIS Lightweight, diamond-type, high tensile, steel frame The riding position is one of the most important features of the R3. Despite its super sport styling the R3 offers excellent rider comfort thanks to its upright riding position. Tapered, long design, high tensile steel swingarm. 41mm KYB conventional style fork offers 130 mm (5.1") of wheel travel. Adjustable Monocross link-less rear suspension with 125 mm (4.9") of wheel travel. ABS equipped 298 mm floating front disc brake squeezed by a twin piston caliper. ABS equipped 220 mm rear disc is squeezed by a lightweight single piston slide-type caliper. Anti-lock braking system (ABS). Lightweight, cast-aluminum 10-spoke mag wheels. Clip-on style handlebars.